A homeless man’s sign had drivers along one stretch of road not only hitting their brakes but also somewhat dazed and confused as they realized way too late that they were driving into his trap. Sadly, it’s not all that unusual to see a panhandler on the side of the road in this day and age. However, residents in Bethesda, Maryland, learned the hard way that you shouldn’t judge a book by its cover. While many likely ignored the homeless man, who appeared to be begging for money along the road, others took a closer look. That’s when they likely wished they had paid attention much sooner as they were forced to hit their brakes. But, it was too late. 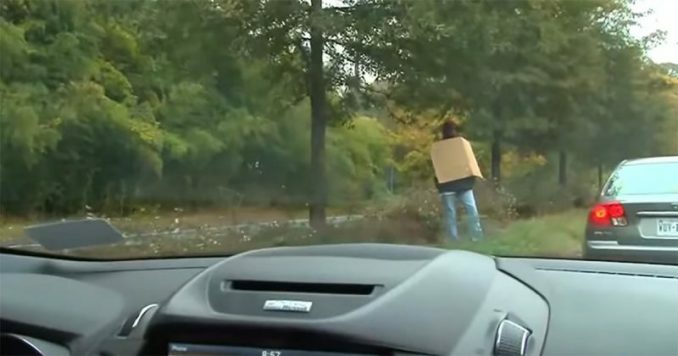 Standing along the side of the road with a sign during the early morning hours as commuters headed to work, the homeless man gave drivers the surprise of their life as they realized they were headed straight into his trap. Dressed roughly, he held in his hands a sign, which contained only a few short words but delivered a profound message, making drivers aware of their mistake when it was already too late. “I’m not homeless. 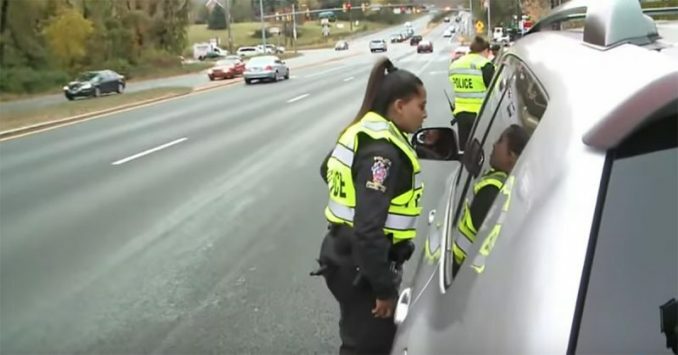 I am a Montgomery County police officer looking for cell phone texting violations,” the sign held by the “homeless man,” who was actually Montgomery County Police Officer Patrick Robinson, boldly declared, letting drivers know that police in Bethesda, Maryland, had decided to take a tough stance on drivers who break the law by using their phones while they are behind the wheel. Distracted driving is a problem that affects everyone, putting all of those who travel our roadways in danger. It’s not just the person who is texting and driving who is at risk from such behavior. Innocent children in another car can and have suffered the consequences of someone else driving distracted when that driver causes an accident, striking the vehicle they are riding in. When behind the wheel of a car, it’s imperative that you are completely aware of what’s going on around you. But, in the technology age, where people are glued to their mobile phones, it’s become increasingly common for the attention of drivers to be stolen away when it is most important. In areas surrounding schools or child-friendly parks, this kind of distracted driving can have disastrous results. All it takes is for a child to run out into the road as an oncoming driver is glancing down at their phone to have devastating consequences. 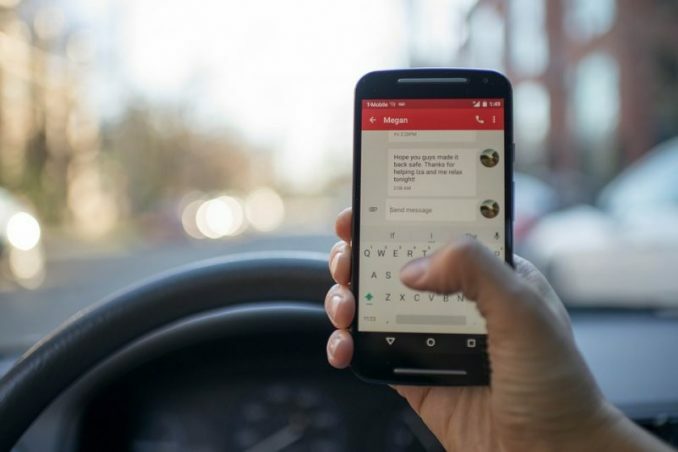 It’s instances like that one that the Maryland officers had in mind when developing their method to help end texting and driving by making sure violators were caught and held accountable. The “sting operation” involves officers going undercover, appearing to be everyday citizens, in order to nab law-breakers when they least expect it — and the homeless man is likely just one “ordinary disguise” they will be using. 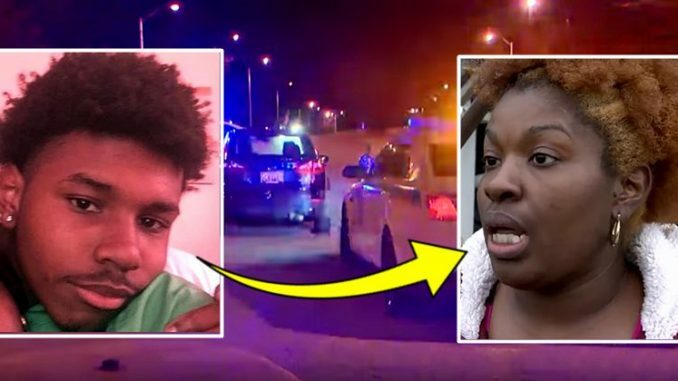 To pull off the sting, the cop was equipped with a wireless mic as he posed as a homeless man along the side of the road, where he had a good view into passing cars. When he saw drivers using their mobile devices, he used the mic to give fellow officers the car’s description. Then, police, who were waiting further up the road, would complete a traffic stop on the guilty party, pulling over drivers in violation of vehicle-based cell phone laws. During Robinson’s operation, which was reportedly only two hours long, he “spotted over 30 [violations] in an hour,” and 56 tickets were issued, in addition to giving out 22 warnings to drivers, Daily Mail reports. Those who found themselves ticketed were also issued an $83 fine for using a handheld device while driving and given one point on their license unless they had previous violations, then the amount increased with each occurrence. While some sensible drivers got the message that safety comes first, others were less than happy about being caught. Of course, they had all kinds of excuses for using their phones while driving. But, there really is no reason that justifies putting innocent lives at risk since every time someone whips out their phone while driving, they are risking not only their life but the lives of everyone sharing the road with them. According to Huffington Post, not only do 1 in 4 motor vehicle crashes involve a cell phone, but nine Americans are killed every day in accidents that were a result of distracted driving, including texting and driving. Is any text message really worth the risk? I don’t think so. With the success of this operation, more are very likely to be organized. Locations are picked randomly, and I have a feeling this could easily catch on with other police departments, too. Sadly, the danger of texting and driving isn’t enough to deter some people from the behavior, but perhaps the threat of a ticket will have them thinking twice. So, be sure to let others know since you never can tell who it might discourage — and you might just end up saving a life.